Well yesterday pretty much summed up our season. A reflection on how we've managed to completely balls things up from start to finish. We should have seen the game at the end of pre-season against Legia Warsaw as a sign as to what was about to come. I can't say we deserved much from the game. We were woeful in the first half and the players were booed off at half time. Two basic errors in the heart of the defence. Who would have predicted that? Second half was better but we couldn't break the Villa defence down. Our attacking options were toothless and when Chamakh did score, it was ruled out by the referee. Van Persie was the hero again. He's been keeping what's left of our season together. I don't know where we'd be without his goals. What is happening at the club must be really hurting him. I could blame the referee for his poor handling of the game and there were plenty of decisions which didn't go our way but that's been the story of our season. Poor officiating of games has become the norm. Yesterday we should have had a penalty and there should have been two Villa players sent off. But we weren't getting those decisions. And again, van Persie was denied by the post in the first half. We'd be top if we'd scored every shot which hit a piece of woodwork this season. These are the margins we're working with. 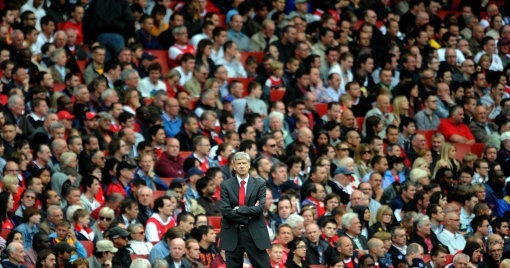 I don't think I've seen less of Arsene Wenger on the touchline than I did yesterday. He must be thoroughly disappointed by many of these players. Of course he won't say it publicly, but I think those who have let him down will be shipped out in the summer. The atmosphere inside the ground was terrible. The club haven't done themselves any favours. Announcing that 60,000+ people were in the stadium didn't go down well. It was obvious from early on walking along Holloway Road that it was going to be a quiet afternoon and once inside the stadium, there were plenty of empty seats. Why do Arsenal lie about the attendance? Why not announce the number of people inside the stadium? The attendance isn't the number of tickets sold, it's the number of bums on seats. And then there was the chorus of "six per cent, you're having a laugh" which rung out around the stadium during the second half. The board have not made themselves popular with anyone with that decision and many people who have had a season ticket for years have decided not to renew next season, purely because they can't afford it. We're in trouble of finishing in fourth spot. Manchester City will leap above us if they beat Stoke on Tuesday night. Winning at Fulham on Sunday is vital if we're to have any chance of avoiding the Champions League qualifying round. But we've got to hope City don't get maximum points from their last two games. The club announced Cesc Fabregas would miss the game next weekend. Many believe that we've seen him play his final game at the club. I don't. I think he'll be at Arsenal next season. However there are plans already set up to ship out a good number of the first team squad. It's going to be a busy summer at the club. We've got a week of pain to get through and then 6pm on Sunday the season will be officially be over. The rebuilding can only start then.